mommy bytes: Is It Magic? What's in this brown box with strange numbers on the end? 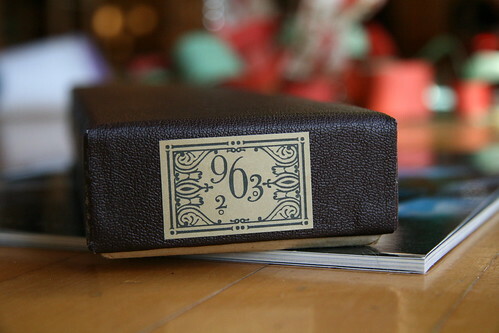 It has different numbers on the other end and is wrapped in beautiful ribbons. 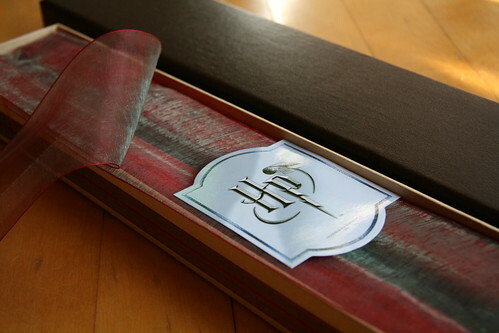 Opening the ribbon, is that HP for Hewlett Packard or Harry Potter? 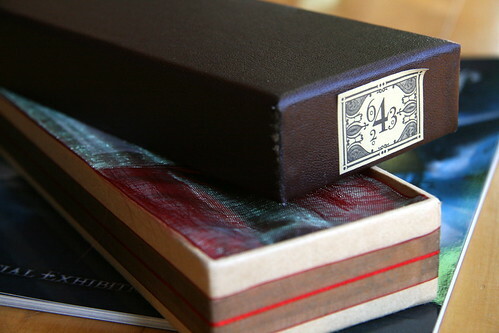 It's Harry Potter's wand in a red velvet lined box! After we were completely enchanted with the Harry Potter Exhibition at the Museum of Science in Boston, I could not resist buying a very expensive replica of Harry's wand for Adam for $45 dollars!???!!! For some reason since it was weighted so well, I really believed it was made from wood. Doug shook his head, and the mechanical engineering brain of mine finally kicked in. 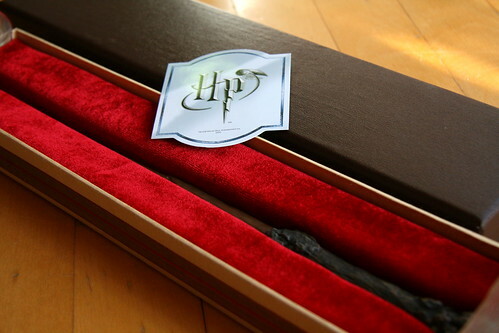 Of course these mass-produced wands had to be injection-molded plastic painted to look like wood. But even so, can it work magic? That night, in our Harry Potter immersion, I downloaded a couple Harry Potter apps for the iPhone. The free movie app, Harry Potter and the Half-Blood Prince (iTunes link), had a Daily Prophet page maker. Using four photographs, they made an animated gif to put into a template. I pointed my phone at Adam and asked him to cast a spell. "Confringo!" he yelled, wielding his wand. There was a crash and hundreds of beads fell on the floor. He had caught the edge of a box full of beads that was on my desk with his wand. We looked up the spell Confringo (for shame, casting spells without knowing what they mean), and learned that it "makes things explode". Oh my gosh, he did exactly that! That awesome smile at the end was taken just after he successfully cast his first spell. He titled the page, "A Muggle Casts a Real Spell!" Animated gif created with Picasion. After that we snuggled up for our every other night reading of Harry Potter. I believe we read the action-packed Chapter 23 of the Deathly Hallows, Malfoy Manor. He wanted to continue, but I insisted on stopping, just let these last few chapters last. Soon we will be all done with the Harry Potter series. It has been our extremely special mother-son bonding time for nearly two years. Something that I hope he will always remember. And that's no magic. 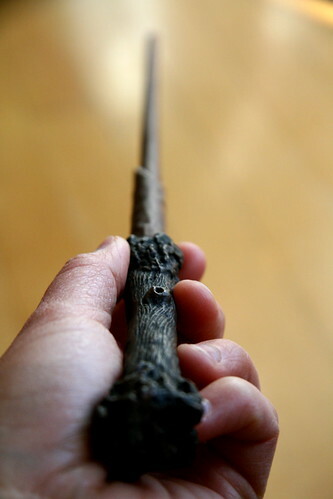 Oh, very cool wand! I'd love to see that exhibit sometime - is it the same one that was in Chicago? My husband would go crazy over it - he's a huge Harry Potter fan. How sweet! My daughter got the series from Santa, and she's loving these books. Extraordinary bond between you and Adam through HP book reading. I enjoyed reading HP too. That is awesome!!! I love the first spell. My Mom always read The Narnia books to us. I just started The Lion, The Witch, and The Wardrobe with Ali - it's so much fun to re-read them with her!